You guys!! I have had the BUSIEST week ever! Seriously I can't believe how much has been going on! I was ready to write this post Sunday night, pictures edited and everything, I have not had one second to do it...until now. 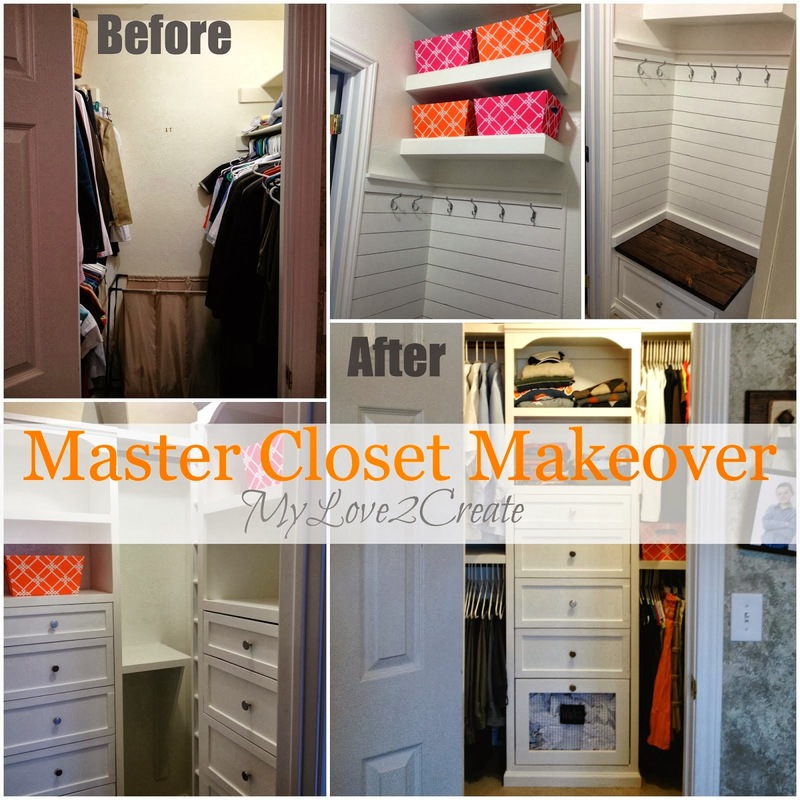 So, if you missed my Master Closet Makeover Reveal that I posted last week you have to check it out! Let's start with the bench drawer. 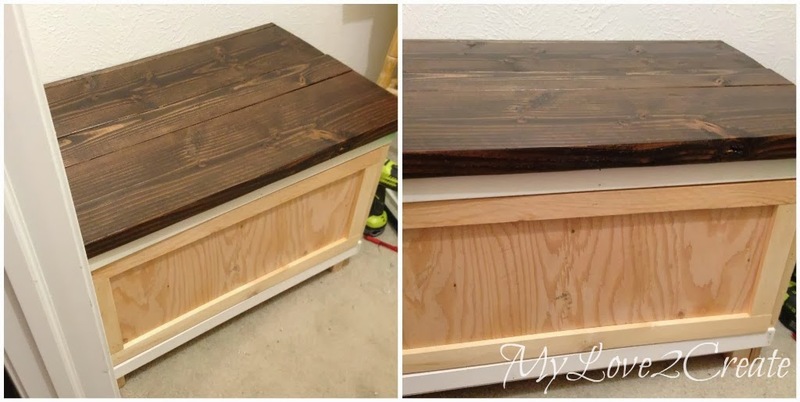 I used more of my free wood/mdf for this drawer. 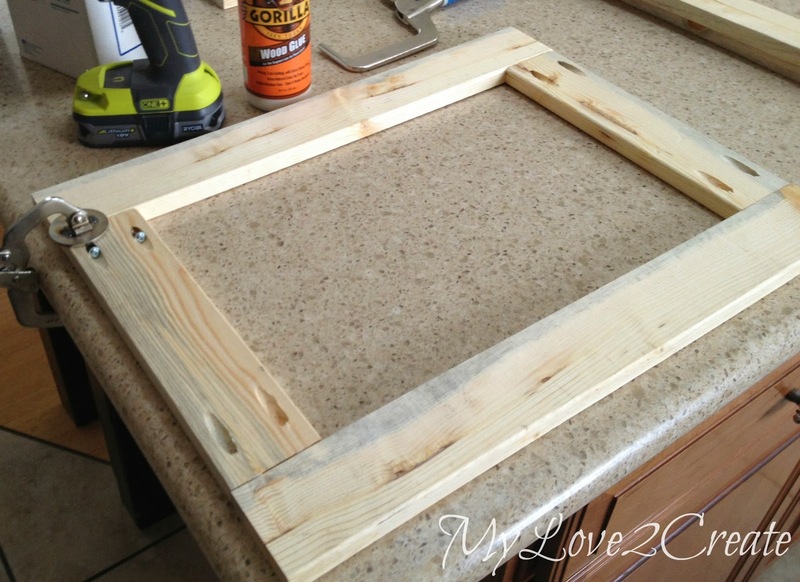 I ended up using one 1/2 inch plywood because that is what I had, I opted to put it together with wood glue and screws. 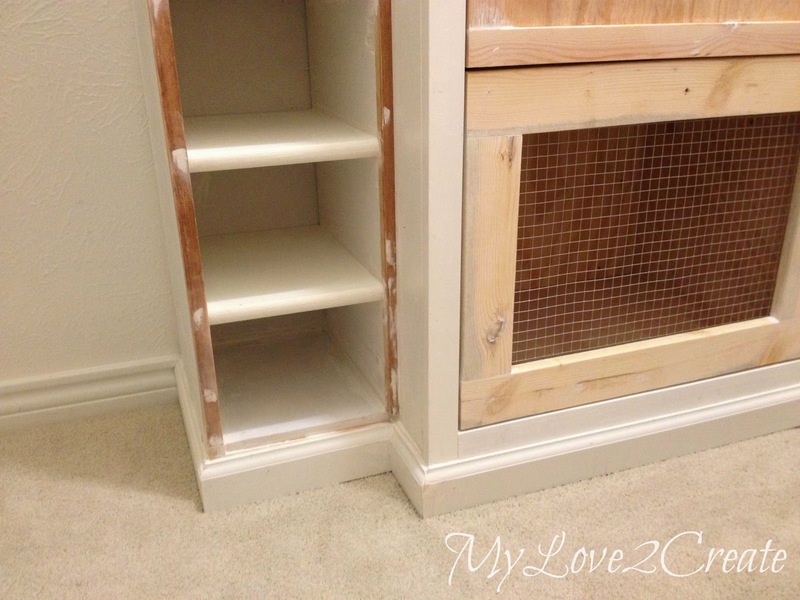 This is also the drawer that I had a heck of a time getting the drawer slides perfect as explained in this post, but it is a closet and when you get to this point you let things go...at least I did, it was good enough. I added 1x2's for trim on the top and bottom. For the sides I used some more scrap trim that was 1x1/2. It was not quite as thick as the 1x2's but, like I said it was a closet and I was DONE. I had also pre drilled and screwed the top of the bench on from the bottom. I took out the drawer to do this and awkwardly laid inside. I think my shoulder is still suffering from that, I had no leverage and It was so hard to do! I use my body weight when I build and I couldn't do it drilling up like that. The moulding I had fit perfectly, but I needed a stop block to keep it from pushing in (see photo on the left). It also helped for nailing it securely. I just kind of built this bench as I went and didn't consider this part, but it all worked out. I also used a stop block for the towers too. See how the drawer sticks out a little on the right? Ugh, this drawer! But, with all the cracks filled in it was looking pretty good. Did you notice the drawer front? Let me show you how I did those. Here is all the wood for my drawer fronts. It was all scrap wood I had collected. The plywood was free and I believe I bought around 20 lattice or lathe sticks in a bundle at the Restore for $1 way back when. The plywood was 1/2 inch thick. I actually measured the opening for all four drawers and cut one sheet of plywood first, since they were all the same width. Then I measured each drawer and cut it to the right height. Above are the two towers with the drawer faces glued and nailed on. 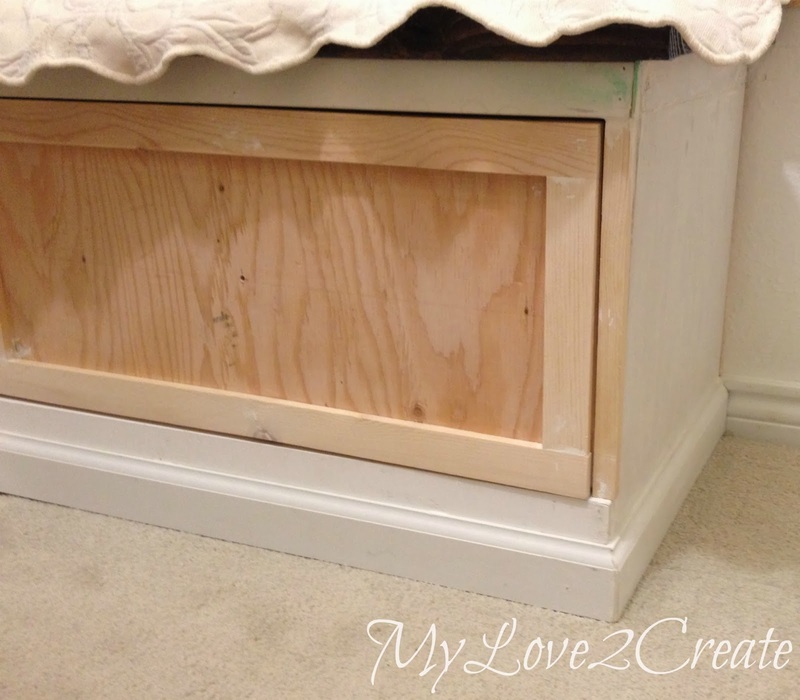 I made sure that the bottom of the wood was just below, or just about even with the bottom of the drawer and glides. I was so nervous about doing this so I did it the easy way, while the drawers were in the tower. I just eyeballed each one and held it in place with one hand and nailed with the other, it worked for me even if it may not be the proper way! Sorry no pictures, I was too busy hoping this was going to work! Next, I added the trim with glue and nails. I started at the bottom drawer, making sure that where the trim was placed the hamper drawer still moved freely and had space for when I added it's trim. 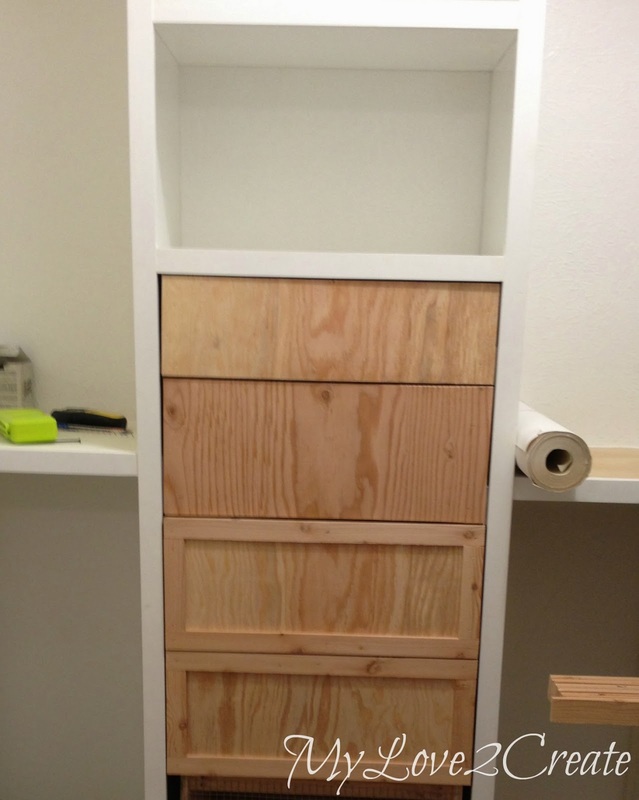 Then I added the two side pieces and finished with the top trim of each drawer. So when he came in a little bit later and they looked like this...he was a little shocked and said, "Wow that looks good!" I am sure it was more in relief than shock, but it made me happy! I was getting so exited at this point!! The end was in sight! ...and screwed them together to make a face frame. Can you see my Gorilla glue? I am telling you it is the best ever!! I use it for all my wood working projects, I love it! I made sure to use it before I screwed the frames together. I made two of these. As you can see in the blurry photos above, I started with a roll of hardware cloth. I laid it out across the opening of the hamper front, then used my wire clippers to clip as close to the edge as possible. Once I did the first clip at the proper width, I just followed down in a straight line. Then, I stapled the hardware cloth on to the drawer front and sides. Notice that the edges of the wire are on the outside and so my clothes don't have anything to snag on! Sa-weet! 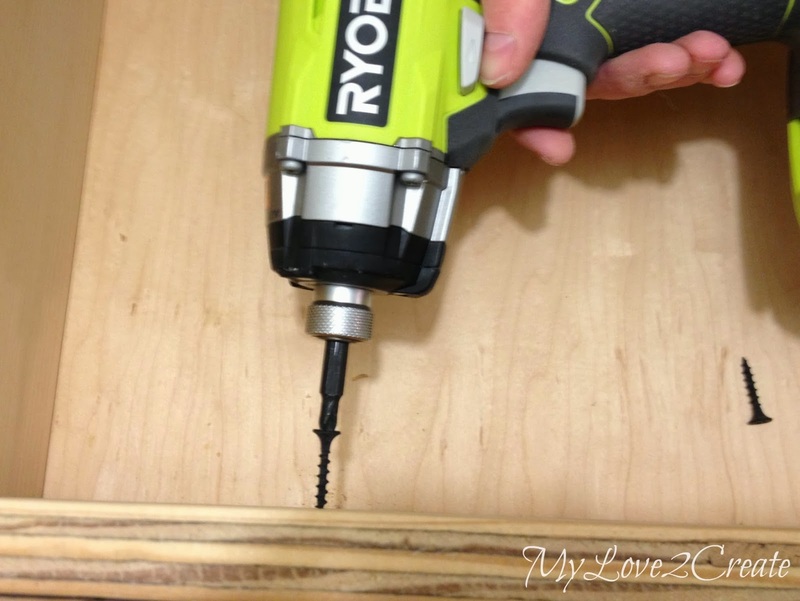 Using the same method of gluing and nailing on as the other drawers, I held the drawer face in place and secured it with my nail gun. I forgot to take a photo, but I used tape on the tower trim to mark where the drawer was located behind so I could nail in the right places. It worked great! You can see I have added base moulding as well in the photo above and filled all nail holes. For the shoe shelf trim I used 1x1/2's and glued and nailed them onto the sides. 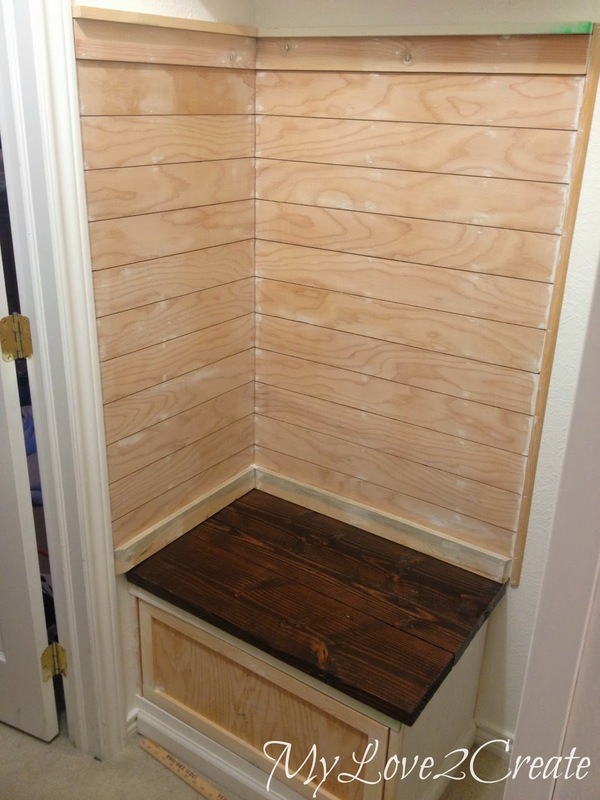 The trim on the outside of the shelf was flat, but the trim closer to the tower I had to turn on the skinny side. You can see the shoe shelf trim better in this photo. 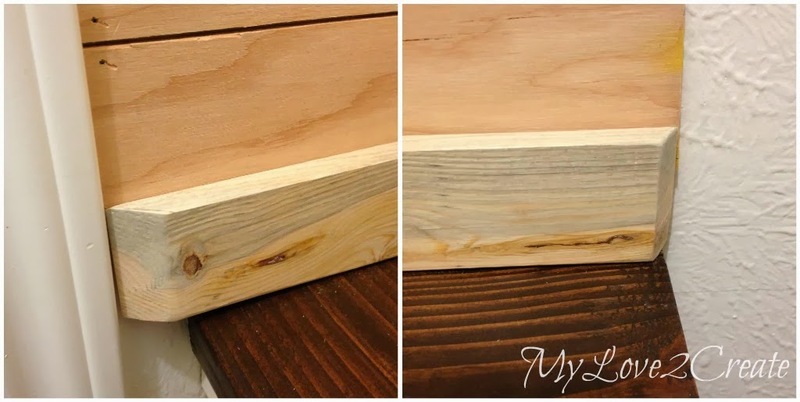 The base moulding was quite a challenge for me because I am still very very very new (like this was one of my first times) to doing moulding with so many corners, but I was very careful in my cuts, using a 45 degree bevel. I only had a small amount of this trim, and I was lucky it all worked out. I think when I was done, I was left with less than 5 inches...phew! Notice the hamper drawer has a hole drilled for a knob? I measured and marked for the knobs. Then drilled them. I also made sure to drill two holes into each drawer from the inside toward the drawer face, and I screwed them together. I did this on all the drawers. 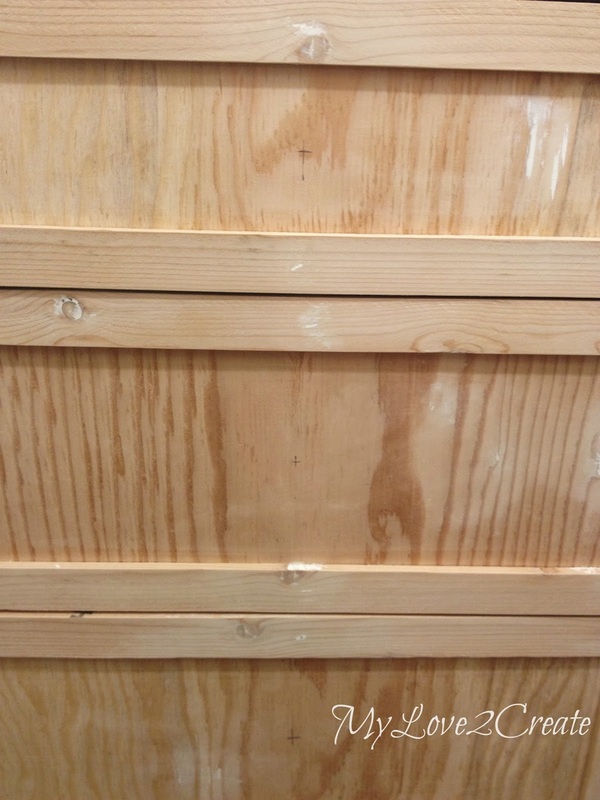 On each hamper I did four screws from the inside two on the top and two on the bottom of the 1x3's. That way I knew my drawer fronts were securely attached to the drawers. Next up is the plank wall!! 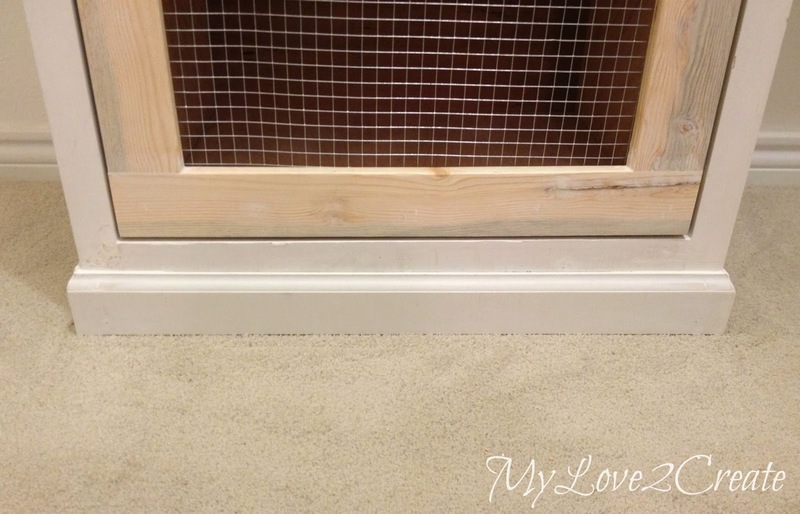 I had a hard time with this spot for a while because I wanted to do board and batten, but the wood I had was too wide and I didn't think it would look good. And then I remembered a trip to the Home Depot a while back and I took the photo below on the left. That piece of 1/4 inch plywood was 51 cents! I had the guy cut it into 3.5 inch strips so someday I might use it in a small space for a plank wall! It was perfect! 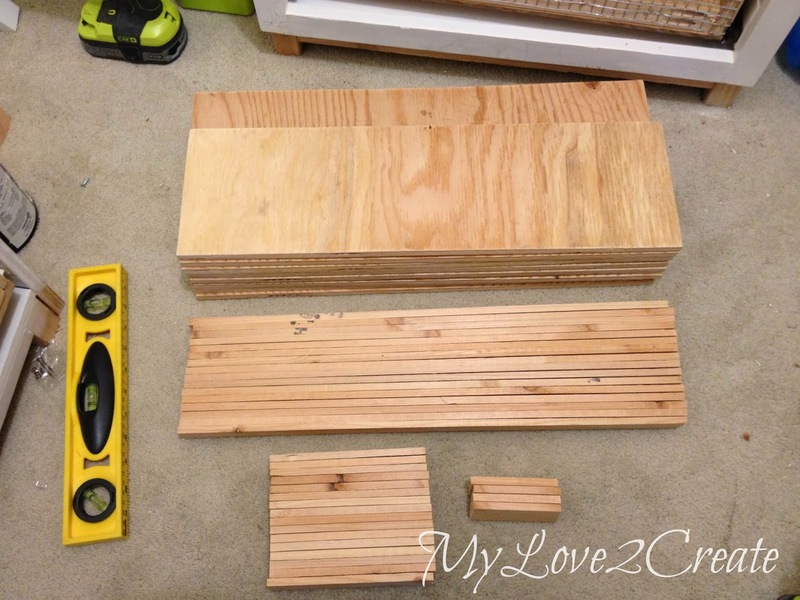 I measured and made my cuts, see how I made it super quick and easy by taping the boards together? I love it when I can do this, it saves so much time, I just cut them all at once on my miter saw. I had already removed tape from the other end when I decided to take this picture, I always tape both ends so the boards don't slide while cutting. I marked the studs in the wall and used a 1x3 for the top board, making sure it was level and nailed two nails into each stud. Using two nickels as spacers and nailed on my plywood planks. I checked for level every now and then. At the bottom I add 1x3's with a tapered end, to trim it out at the bench. I added 1x2's to the top of the 1x3's to make a ledge at the top, and a strip of curved trim (sorry I have no idea what it is called it was in a free scrap pile) to the edge of the plank wall to make it look finished. Then filled all the nail holes with spackle and sanded it smooth. 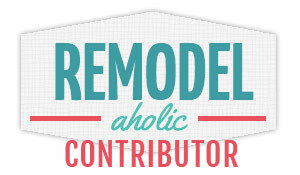 I used caulk for the moulding pieces and trim pieces. And then I primed the bare wood parts to the whole closet twice, and painted it twice. That was a fun day! 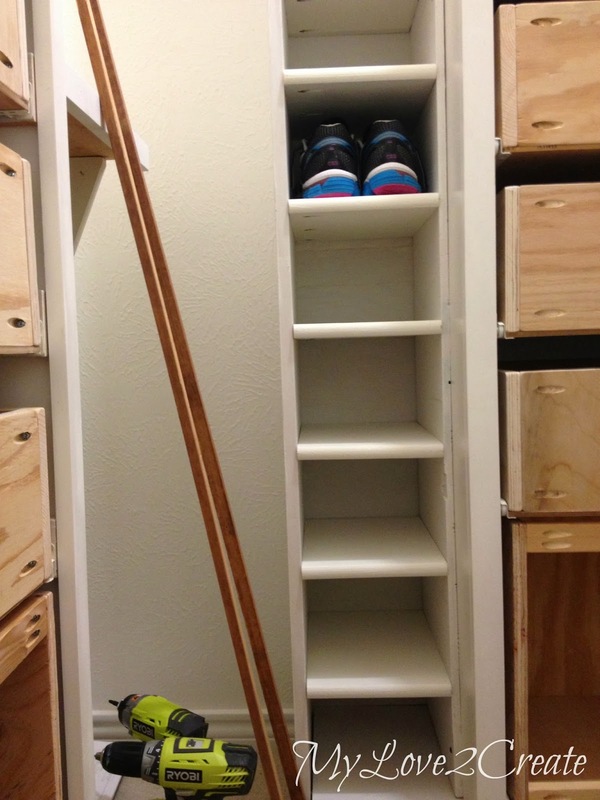 It took forever to do the shoe shelves, thank goodness I had at least primed them once before I built it. I did take pictures of the painting, but I searched everywhere and they must have been accidentally deleted! Oh well! And that is it, I added the knobs and I was done! FINALLY!!! YIPPEE!! I love to just sit on the bench and stare at how awesome it is, I have been dreaming of doing this for SO long I am so glad I finally just took the plunge!! 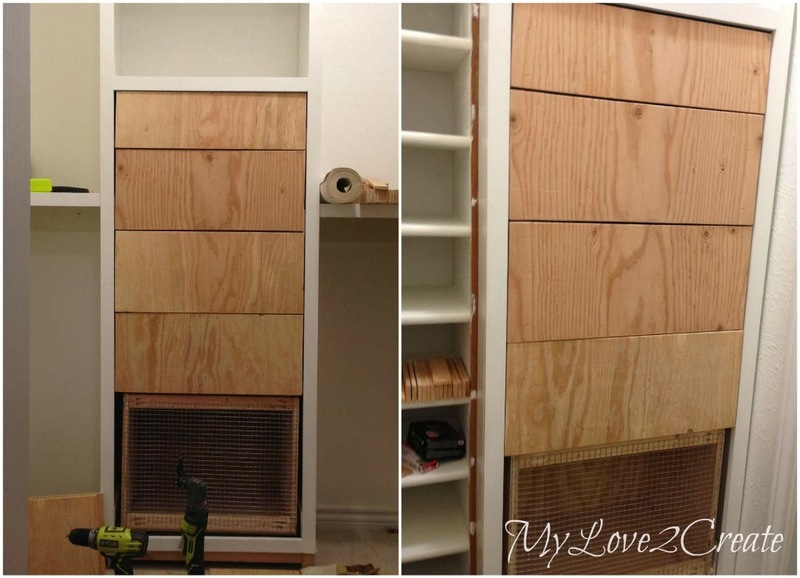 If any of you that want a cool closet, you can totally do it! Seriously. That is why I blog, to inspire others. Believe me my closet is not perfect. Isn't that how people are? None of us are perfect, but we love each other for who we are. And I sure do love my closet, imperfections and all!! If you haven't seen the reveal pop on over and check it out!! Thank you so much for following me on this long journey! Please tell me you did NOT paint everything by hand. :( Do you have a paint sprayer? If so, what brand. .51 cents? my home depot doesn't do that anymore. The other day I caught them throwing a piece of peg board and a piece of thin plywood away--stuff that would have normally been .51 I asked if I could have them, and they said yes. I was surprised. I would love to go dumpster diving there. So much waste! Oh my word! IN LOVE! So cool that you built it yourself!!! awesome! closet envy over here. So impressive Mindi! Inset drawers are my downfall. I love the mesh on the hamper too! Pinned. 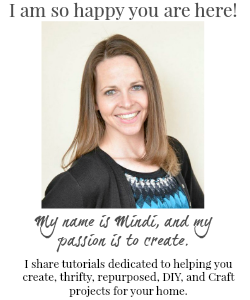 Mindi, I just read each and every word in your post and let me tell you, you are amazing! I was waiting to see the tut for the drawer fonts, love it! 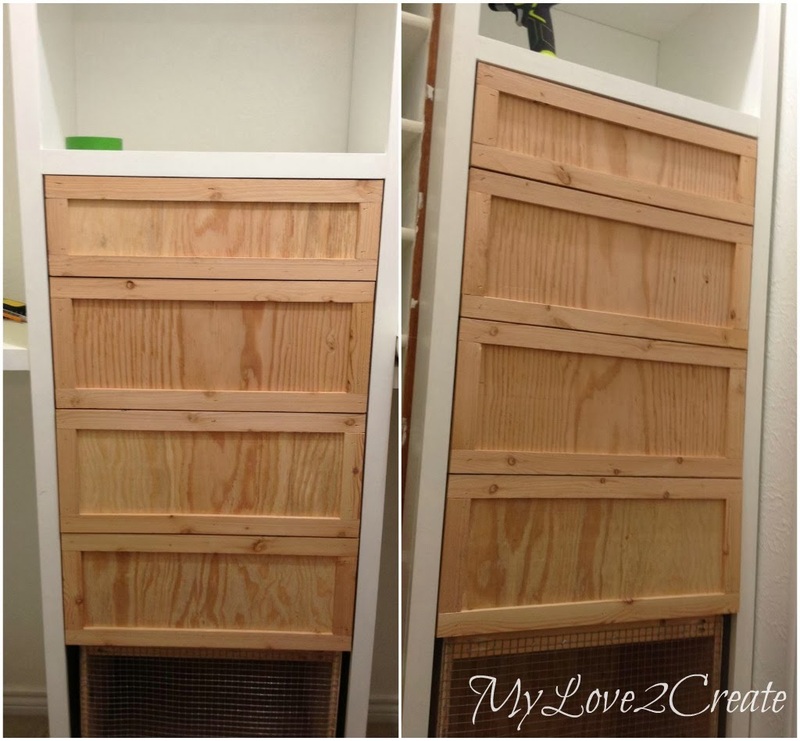 I also use Gorilla glue and love it, sometimes I'm afraid to use it because if I have to undo something, whatever has glue on it is going to be a pain :) Enjoy your beautiful closet! You did such a good job on this Mindi. I love how you broke it down and showed how you did these steps. The hampers are awesome, and I adore that plank wall!